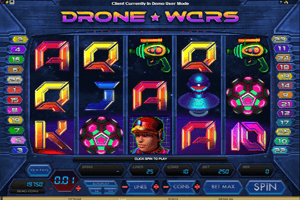 Drone Wars is a futuristic themed video slot machine by Microgaming that takes place in the future where the war takes places in outer space. This is why players will see plenty of futuristic looking symbols that include space drone pilots, alien space crafts, futuristic ray guns and other modern looking icons. They all come in great visuals and the game itself comes packed with great audio effects. On top of that, since the game is powered by Microgaming, players can expect to find a great set of high paying icons and special features that will make their stay at the game worthwhile. Play Drone Wars Slot here. The game has five spinning reels and a total of 25 paylines that players can place wagers on. They will do that by going through the available wagering options that the game has to offer. These options are located under the reels of the game, they are the number of lines, the coin value and the number of coins. The Wild Ball of light is the wild icon of the game that can replace other icons in order to help players get paid. The only exception is the scatter symbol which can give out generous scatter rewards as well as triggering one of the two bonus features of the game that are called the Space Attack or the Planetary Assault.